"It's getting awfully dark, Kurt" Anna said, gripping her boyfriend's hand tightly. "I thought we just came down here to watch the sunset. "Well, It's set now," Anna pointed out. "Shouldn't we be going?" Anna enjoyed coming down to the docks during daylight, but at night they seemed an entirely different place - a spooky place. "So soon?" Kurt asked, his shoulders drooping. "I was hoping I might..." he paused, nervous to even say it. "What?" asked Anna, her thick eyelashes blinked twice in quick succession. "Kiss you," Kurt blurted out suddenly. There, he'd said it. "On the tenth date? That's a little too fast for me," Anna said. "Sorry, Anna," said Kurt. "I guess, deep down, I'm glad you're not that kind of a girl. It's just that you're so gosh darn pretty." He had a point there. "Well, that's true," Anna said. "So I'll forgive you." The happy teens stood gazing into each other's eyes for several seconds. "So are we going, then?" Anna asked. "Oh, right, sure," Kurt said. And as they turned to walk off the docks, they were both knocked unconscious by a blow to the backs of their heads. The next thing Kurt saw were several points of light floating around in his field of view. "I'm seeing spots!" he thought to himself. He soon realized, however, that these spots were the stars. He was laying flat on his back... but why were they moving? Kurt stood up to look around and the reason became shockingly clear: he was out to sea! With only the faint light of an orange moon to see by, Kurt couldn't make out much, but it was clear he was on a large, wooden sailing vessel. How far from land they were or how long they'd been adrift, he couldn't say. Anna! Kurt suddenly realized he didn't know where his girlfriend was. He looked down and was glad to see she had been laying on the deck right next to him. Even unconscious, she was the picture of loveliness. He thought, for just a moment, of kissing her hand while she slept. But no, a gentleman would do no such thing. Kurt knelt down and patted his sweetheart's hand. "Anna," he called softly. "Wake up." Anna woke up slowly and Kurt explained what little he had discovered of their situation. "Oh, Kurt," Anna cried, placing the back of her left hand to her forehead. "It's just awful." Who could it be, approaching Kurt and Anna from the darkness? "I know," Kurt said. "But you'll be all right. I promise." Just as this assertion began to ease Anna's worry, a harsh sound broke the quiet of the night. It was the voice of a man. "Argh! Who goes there?" the voice bellowed. Kurt and Anna were struck dumb with fear. A dark silhouette of a large man was lumbering across the deck toward them. "Well, who be ye? Speak up!" the man yelled. Anna was just about to scream out in terror when the man stepped close enough to be recognized. 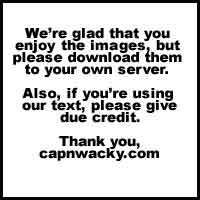 It was Cap'n Wacky, beloved corporate spokesman for Amalgamated Humor, Inc. and hero to millions. They both knew him immediately because they enjoyed the many quality products that bore his likeness. From T-shirts to lunch boxes to sandblasters, you know it's quality if you see the Cap'n on the label. "Oh, Cap'n Wacky, am I glad to see you," Anna sighed. "Me too!" said Kurt. "I love your fish-flavored chips!" "Fish 'n' chips in one!" The Cap'n laughed. "Who wouldn't? But I must ask what brings ye here. Are ye stow-aways?" "No, Cap'n," Kurt assured him. "We were just on the docks and the next thing we knew, we woke up here on your ship." "Oh, this ship we be on tisn't mine," the Cap'n said. "There's something wrong with this ship an' I been hired to find out what." "What do you think it is?" Kurt asked. "The rudder? The sails?" "No," the Cap'n said, his normally-jovial face turning grim. "It's nothing like that. This ship be HAUNTED!"